Crossing half way across Europe, absorb amazing changes, incredible variety of medieval towns, UNESCO heritage sites, Gutenberg bibles, Marc Chagall’s stained glass and sights too numerous to mention. You fly to Düsseldorf or Cologne from where a coach will take you to the ship. Moored in Cologne’s picturesque historic centre, the dedicated crew will welcome you aboard your first-class floating hotel, ensuring you settle into your comfortable and extremely well equipped cabin and familiarise yourself with the ship. The first morning on a river cruise is always a thrill. Awakening to the gentle lapping of the water and the colourful valley sides slipping effortlessly past your cabin window, there really is no other holiday experience quite like it. Call at historical Koblenz, dominated by its immense fortress overlooking the confluence of the Rhine and the Moselle. This morning take a guided walk around the old town exploring its twisting streets and picturesque squares. During a delightful lunch cruise to Boppard, ‘Pearl of the Rhine’, wonderfully situated on a sweeping meander, it really is one of the most attractive villages in the Rhineland. Its delightful stone quayside is lined by boats of all descriptions against a backdrop of archetypal half-timbered buildings and cobbled streets, all surrounded by Germany’s finest Roman walls. Today, you experience one of the real highlights of your cruise, the passage through the Rhine Gorge. Here the valley narrows, the current is swifter and the towering valley sides soar to more than 200 metres, crowned at every turn of the tortuous river by the precarious ruins of castles that once held sway over passing mariners. Pass rocky outcrops and around endless twisting bends to the famous Loreley Rock, where legend has it, enchanting maidens lured unsuspecting sailors to watery graves. Next call at Rüdesheim, a true Rhine wine town with many famous wines available to sample, as you wander the typical backstreets. This morning, take the short cruise to the confluence of the rivers Rhine and Main at the fascinating town of Mainz. An important Roman city for 500 years, with the largest amphitheatre north of the Alps, it is home to the fine St Stephen’s church where light flickers through beautiful blue stained glass windows with their intricate biblical figures – a masterpiece by the great artist Marc Chagall. Mainz’s most famous son though is Gutenberg, father of modern printing, and there is an excellent museum where you can see two original Gutenberg Bibles, the earliest books ever printed in Europe. During dinner your ship cruises up the River Main. This morning, cruise between dense forests to the beautiful small town of Miltenberg. Developing through the Middle Ages under the powerful protection of the nearby castle, surrounded by walls, it is one of Germany's best preserved medieval villages. During lunch you'll cruise around the first of the many meandering bends which so characterise the River Main, pausing at Wertheim, one of those towns which is a joy to stumble across - completely unknown on the mainstream tourist trail. Please note: when cruising from Mainz to Passau the sun deck is closed due to low bridges. Breakfast is taken whilst cruising towards Würzburg, situated at the head of Germany’s ’Romantic Road’ and you'll have a walking tour of this lovely city. A former seat of the Prince Bishops, their truly magnificent Residenz is one of Europe’s finest Baroque palaces, constructed to compete with the greatest courts of the day such as Vienna and Versailles, which in artistic terms they more than succeeded in doing. Today visit Bamberg, quite simply one of the most beautiful small towns in Europe, easily on a par with Prague. The masterpiece you see today began its artistic journey during the 11th century, when the Emperor Heinrich II planned a capital as grand as Rome and selected Bamberg as the location for this. Although it never became as large as Rome, for its size it has a wealth of fine buildings. Not only is it historic, it is stunning too with a network of canals like Venice and the fascinating tangle of lanes, lined with merchant’s houses. Call at Nuremberg which, sadly will always be associated with the Nazi period, where the Third Reich held court against a grandiose background of marching grounds and later with the international war crimes tribunal which brought down the final curtain on that notorious regime. What is less well-known is that Nuremberg is regarded as the capital of Germany’s First Reich, the era that lasted 1,000 years, and was central to the trade routes and power of the Roman Empire. This morning, include a guided tour taking in the great ramparts and many fine historic buildings from Nuremberg’s Imperial Age including the Kaiserburg Castle, Craftsmen’s Court, Church of St Lawrence and the Market Square with its beautiful fountain. This morning, cruise along the Main- Danube canal to Kelheim and the Danube, one of the most famous and beautiful rivers in the world. Visit Regensburg, originally a Roman garrison guarding the most north westerly point of their empire, dominated by its cathedral, the finest in Bavaria. This afternoon, take a stroll into the historic city centre and visit the Altes Rathaus, the town hall with its great Gothic hall where many of the great events in Germany’s history were solemnised. Regensburg calls itself Germany’s best preserved medieval city, and it is hard to argue as you wander amongst the glorious winding streets and alleyways of the old town. Passau is your last town in Germany, nestling as it does where the Danube gorge widens. Your fascinating journey continues into Austria, synonymous of course, with superb scenery but this beautiful section of the valley is something of a secret. Relax aboard the ship today, as you cruise through the narrowing valley. On a striking and resplendent rocky bluff above the town of Melk is an enormous Benedictine Abbey which you visit this morning. This extraordinary building was originally a Hapsburg palace, and subsequently bequeathed to the Benedictine order during the 11th century. It has been a monastery ever since. Reconstructed in full Baroque style during the 18th century, the Abbey has many fine rooms and a stupendous library with more than 80,000 priceless volumes including many intricate medieval manuscripts. As lunch is served you cruise downstream, through the delightfully picturesque Wachau valley, before approaching your destination, the city of Strauss – Vienna. To celebrate the city’s wonderful legacy there is an arranged classical recital on board by a quartet of talented musicians. To hear this exquisite music whilst in the city of its creation makes a wonderful finale to the day. Vienna, a truly elegant city, is one of the real gems of Central Europe, conjuring up an image in the mind of culture, ornate architecture, elegant cafés, aristocratic palaces, imposing cathedrals and everywhere the romantic music of the great composers. To be fair the reality is little different and as capital of the Hapsburg Empire, which held sway over much of Central and Eastern Europe for centuries, there is an absolute wealth of things to see. In its heart you have the lovely St Stephen’s cathedral, then the Hofburg, now home to the crown jewels and relics of the Holy Roman Empire, the Vienna Boys’ Choir and the famous Spanish Riding School. This morning you will have a guided tour and the afternoon is free. 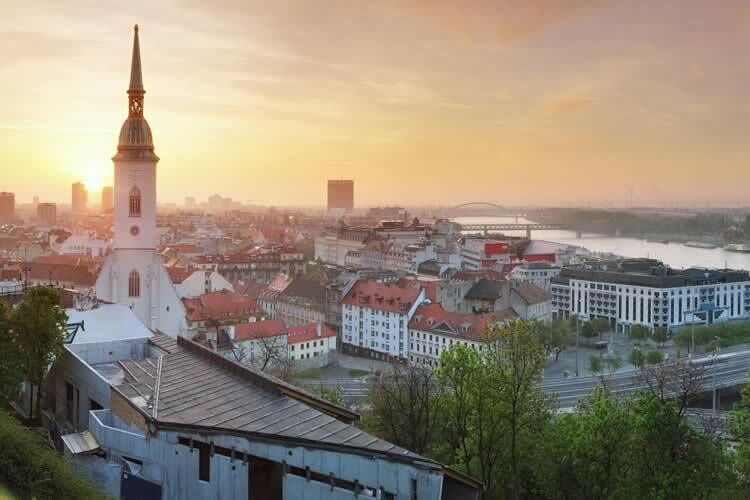 This morning explore Slovakia’s fast emerging capital city, Bratislava. Until recently swathed in the drab uniformity of communism, the city has shrugged off its greyness, rekindling the splendour of its imperial past, so evident in its beautifully restored baroque old town. Wander the winding streets to the Main Square where you will find the former old town hall now housing a museum dedicated to the history of the city and where you may climb the tower for some lovely views. Equally impressive is the great 17th century fortress which dominates the city with its commanding expansive views across the Danube. Or head for the Primatial Palace with its fabulous Hall of Mirrors and rare collection of 17th century English tapestries or for something less strenuous perhaps enjoy a freshly ground coffee or homemade lemonade in one of the many bars of cafés. This afternoon your cruise reaches another highlight as you navigate the dramatic Danube Bend, one of the most spectacular stretches of this mighty river. Winding its way through a narrow twisting valley, flanked by high mountains and verdant hillsides, have your camera at the ready for some quite exceptional river views as you pass ancient ruins of castles and historic towns. Your journey’s end is reached as you cruise into Budapest, enjoying spectacular views of this breathtaking city on your stately final approach. Arrive in imperial Budapest, straddling the beautiful river. Dominated by the castle, the city, often called ‘Little Paris of Middle Europe’, is famous for the monuments that reflect both local culture and that of numerous foreign powers, which ruled here for most of its existence. Today, Budapest is a collage of palatial buildings, baroque churches with archaic spires and a wonderful atmosphere enhanced by the unique sound of Hungary’s music and language. Enjoy a guided tour and this evening the ’Captain’s Dinner’ will take place, serving delicious specialities of the countries and regions you have visited during your cruise. It will feel like you have been away from home for months, as you recall all the places you have visited, sights you have seen and people you have met, with your fellow travellers. After breakfast it’s time to say goodbye to your crew and transfer to the airport at the appropriate time for your flight to the UK. Guided tours in Budapest, Vienna, Nuremburg, Bamberg, VBratislava, Koblenz & Wurzburg and visits to majestic Benedictine monastery, Melk Abbey. For all 2019 departures you can now purchase a drinks package, at a cost of £209 per person.